Let’s take another short roadtrip today, with a twist: though we will see the sights on land, most of the actual journey will be a cruise. We’re starting the day at Ludington, Michigan, where we find two US-numbered routes. Highway US-31 currently runs 1280 miles from just south of Mackinaw City, Michigan to Spanish Fort, Alabama. In 1962, it was a little longer on both ends. The north end went to the Mackinac Bridge and the south end went into downtown Mobile, Alabama through the Bankhead Tunnel. Our travel, though, will be on US-10. This route currently runs from Fargo, North Dakota to Bay City, Michigan. In 1962, it continued south to Detroit, Michigan, overlapping with our Roadtrip-'62 ™ US-23 trip for 30 miles. The route also used to run about 1700 miles farther west, ending at Seattle, Washington. Beginning in 1969, for about the next 20 years it was shortened west of Fargo as each segment of I-90 or I-94 freeway was completed. Before we take our cruise, let’s enjoy our day in Ludington. I’m starting from the Vista Villa Motel, where I stayed last night. It was opened with just 6 rooms in about 1957, and expanded to 14 rooms by about 1962. It’s even larger today with some newer rooms, and the whole place has been completely remodeled, creating a clean, comfortable motel that is priced generally lower than chains such as Super 8 or Holiday Inn Express. There are several older restaurants in town to choose from for breakfast, including Gibbs Restaurant, and the Kuntry Kubbard. I’m stopping at the Old Hamlin Inn, as it has won local awards for the best breakfast in town. The sign out front says they have been open since 1926, but that’s for their first location several miles north, on Hamlin Lake. The restaurant moved to the current building in 1942 and is still owned and operated by the same family. People say they have great homemade bread, so make sure you order a breakfast that includes toast. They close for part of the winter. After breakfast, we’ll head straight through Ludington on M-116 from where US-10 turns left to the ferry docks. Note the location though, because we’ll be back here later. At the end of town, M-116 turns right to follow the Lake Michigan shore. Stearns Park, in front of you, is a favorite place for sunsets. We’ll follow M-116 (Lake Shore Drive) north to Ludington State Park. Lake Shore Drive is well named, as it allows you to see a good section of lakeshore after you leave town. The lake in the State Park, Hamlin Lake, and the lake you drive across the marsh of as you leave town, Lincoln Lake, were named for President Lincoln and his Vice Presidential running mate in the 1860 election, Hannibal Hamlin. This area was being settled and developed for lumber mills at about that time, and developer Charles Mears apparently was a supporter of these candidates. At the big curves in the road, where you end up right on the lakeshore, there used to be a railroad crossing. Since the 1930s, Sargent Sand Company has held a permit to mine sand here. Though the sand is no longer transported by rail, the sand dunes just to the right of the road are still mined. This sand was used for many industrial purposes, including metal castings in the General Motors foundries in Saginaw, Michigan during 1962, one of the cities on our US-23 roadtrip. Eventually, the cost of owning and operating a railroad just for the sand shipments became too high, especially as metal casting needs declined. However, the mine has found a new life because the high quality sand here is used in oil fracking operations, which have boomed in recent years. If you look to the right as you drive by, you can see some of the mining equipment in the low areas between dunes. The property is surrounded by Ludington State Park property and Sargent Sand has sold a large part of its property to the state, but has retained about 400 mineable acres. Ludington State Park is a beautiful park of about 5,300 acres of sand dunes, scenic shoreline vistas, ponds, marshlands and forests. After we enter Ludington State Park, we’ll have to make our most difficult decision of the day: which trails to hike. The problem is that there are so many beautiful trails. There is even a canoe trail, where you can rent a canoe for the day and explore the shoreline of Hamlin Lake and its islands, and portage to some smaller nearby ponds. I’ve done that but I prefer to hike. Another great trail is along the Lake Michigan shore, north to the Point Sable Lighthouse. It’s nearly two miles of unbroken sand and surf, with dunes on the inland side. Michigan is home to over 275,000 acres of coastal sand dunes. These sand dunes are constantly being reformed as winds blowing across Lake Michigan from the west move the existing sand and deposit new sand from the prairies. From the parking lot, we’ll cross the road and the bridge over the Big Sable River. Beware of the geese here, as they can be aggressive if bothered. The bridge is adjacent to a salmon feeding station in the river, and feeding times for the salmon are posted. These fish are released into the river when grown, to stock the sport fishery in Lake Michigan. There used to be a Visitor Center across the bridge, but the roof caved in from a heavy snow load a few years back and the building has not been reopened yet. If you want to climb a sand dune, try the Skyline Trial, which can be accessed just off the Visitor Center Parking Lot. It’s a boardwalk trail, to prevent erosion of the dunes. I’m a little too lazy for the steep climb, so I’ll take the river walk. The Skyline Trail rejoins the riverwalk about halfway to Hamlin Dam, so I’ll meet you there. Hamlin Dam is almost like a waterfall on the river. It was first built in 1852 by Charles Mears and his logging company, to hold logs in the lake and provide power for the sawmill. The Big Sable River was rerouted into its present course, to allow shipping to reach the dam. An entire town grew up around it, though nothing remains now. The dam broke a couple of times, but was rebuilt even after the lumbering was over because many cottages had been built around the lake and depended on the high water shoreline. Today the dam area is full of fishermen and the swimming beach is just on the other side. The author on the boardwalk of Lost Lake Trail, Ludington State Park, Michigan. There are many more trails through various parts of the woods, but the best one, in my humble opinion, is the Lost Lake Trail. This trail uses a series of boardwalks to hop from island to island in Hamlin Lake, and make an easy loop of about 2¼ miles. I found that you can make it even longer and more interesting by either starting near the Visitor Center as we did, or by starting from the parking lot near the park store at Cedar Campground. If you start at the store, continue through the parking lot for the swimming area, staying near the lake, and you will find the Lost Lake Trail. Turn right at the first boardwalk and you’ll soon cross a bridge and head out to the islands. These islands are narrow strips of sand that were barely higher than the water level of the dammed Hamlin Lake, and give a feeling of wandering around in the lake at some points. I’ve seen deer, swans, frogs, beaver, herons, and even river otters on this trail! Swans are almost always on Lost Lake. Take your time, as I believe this is the prettiest part of the park. As the trail finally turns away from Hamlin Lake, you have to climb partway up a dune and head slightly inland. At the trail junction you could take several other trails that criss-cross the wooded dunes in the park, but we’ll stay on Lost Lake Trail and head back towards the campground. As you approach the campground, the trail heads out over the shallow water of the lake on a boardwalk. This gives a great opportunity to watch fish in the shallows on the landward side. If the kids haven’t scared them all away, you may even see a turtle or frog. Signs along the boardwalk point out some of the wildlife to look for. At the south end of the campground, a bike trail crosses the roadway. Turn right on this trail and it will take you right back to your car. If you’re not fond of hiking, you can just stay out on the great beach all morning. Either way, we’ve pretty well spent our morning, so let’s enjoy the drive back to Ludington and find a late lunch. And I know just the place! The Park Dairy House of Flavors has both great food and a great hometown ice cream parlor atmosphere. They’ve been around since 1948, with the ice cream manufacturing and packaging plant right behind the ice cream parlor. In fact, House of Flavors is Michigan’s largest ice cream manufacturer under one roof. If you like fresh, this is the place! Try to leave room for desert, because their specialty apple sundae is well worth the extra calories. After lunch, I’ll spend part of the afternoon shopping Ludington’s touristy downtown. Then, it’s off to Stearns Park, which we passed this morning. A half-mile walk out to the lighthouse at the end of the pier is great, especially when a stiff wind and waves are coming in. You can really feel the power of nature on those days. The park is also a great spot to watch sunsets, but since we’re not staying in Ludington tonight, we’ll have to see our sunset from the deck of the ferry instead. While we could not have played mini-golf at the Stearns Park back in 1962, because the Jaycees’ Miniature Golf Course was only opened in 1967, it’s still a nice retro thing to do. And, it supports local charitable organizations and causes. After our game, the sky is dimming a bit, so it’s time to head over to the ferry dock. The S.S. Badger’s sister ship S.S. Spartan, docked in Ludington, Michigan, in the evening. Highway US-10 is one of only two US-numbered highways with a ferry connection, the other is US-9, between Cape May, New Jersey and Lewes, Delaware. Highway US-10 used to officially be two separate parts, but in 2015, the S.S. Badger was officially designated as part of the highway. The S.S. Badger now actually has an image of a US-10 route sign on the ship! The ship began service in 1953 and was only 10 years old by 1962, so we could have enjoyed it then in its glory years. The S.S. Badger is the largest car ferry ever to sail Lake Michigan and is also the only coal-fired steamship still in operation in the United States. While the ship was built by the C&O Railroad primarily to transport railroad freight cars, it also ferried passenger cars and had superior passenger accommodations. It was completely refurbished in 1991 with a buffet-style dining area, private staterooms, and even a movie lounge so you can once again enjoy the cruise in comfort. The S.S. Badger’s sister ship, the S.S. Spartan, is also docked here. Both ships, together with the S.S. City of Midland, made ferry runs for the C&O Railroad and its successor company Chessie System, between several cities on both sides of Lake Michigan until 1983, when the Chessie System ended its railroad car ferry service. The S.S. Badger is the last of the 14 ferries based in Ludington remaining in service and has been designated a National Historic Landmark, a registered historical site in both Michigan and Wisconsin, and the Badger's propulsion system was designated a mechanical engineering landmark by the American Society of Mechanical Engineers. The ship has a reinforced hull for ice-breaking, allowing it to operate year round. Railroad ferries once ran from Ludington to Milwaukee, Manitowoc, and Kewanee, Wisconsin. When it was overhauled in 1991, all railroad car facilities were removed. The trip across Lake Michigan takes about four hours to cover the 62 miles from shore to shore, saving about 3½ hours compared to the trip by car around the bottom of the lake at Chicago. Besides passenger cars, the S.S. Badger's large deck space allows it to transport tour busses, commercial semi trailers and larger commercial loads. For example, it has moved wind turbine components over 150 feet long from Wisconsin. Motorcycles are also welcome. The ferry offers entertainment options and eating facilities on board, as well as passenger staterooms with sleeping berths. That’s where I will also spend at least part of the night, because I’m taking the evening cruise. When I last sailed this route in about 1974, I went in the daytime and enjoyed walking the deck, watching the lake, and sitting in the lounge when I wanted to get out of the sun. Tonight, I’ll enjoy the sunset from the deck before eating. 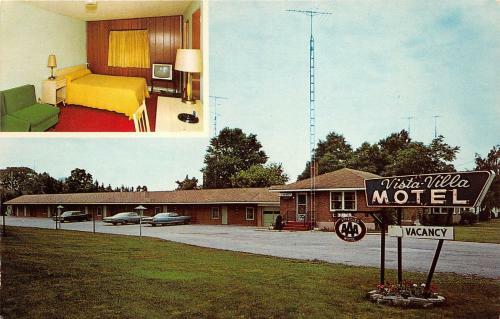 See you tomorrow in Manitowoc, where I may write a Roadtrip-'62 ™ post about seeing the 1962 sights of that part of US-10. Please check out the fine folks in our public service announcement!